"Not to be confused with America." - Wisdom is the retention of innocence through adversity. "Not to be confused with America." Nobody reay really knows the origin of the name of our Great Purple Land, America. It is claimed that a Portuguese mapmaker of a similar name, Amerigo Vespucci, signed his name at the bottom of a map, which people subsequently thought was the actual name of the new yet mythical continent, (first thought to be India, yars). Well, this is possible. But if you simply take the word apart, you get A - MER - IKA, meaning, in Frenchwise, "At the-sea place," or the place across the sea. The fabled land beyond the horizon, opening up its arms to the religiously and economically persecuted. It may be coincidence, but there once was another place, in France, with an almost identical name, "Armorica," which is Gaulish for, "The Place by the Sea." During the 5th-7th centuries, this somewhat vacated land, came to be a place where Celtic immigrants went to flee harsh conditions in Britain, which was being dominated by Saxons, (whom King Arthur supposedly beat at some point in myth). "According to C.E.V. Nixon, the collapse of Roman power and the depredations of the Visigoths led Armorica to act "like a magnet to peasants, coloni, slaves and the hard-pressed" who deserted other Roman territories, further weakening them." 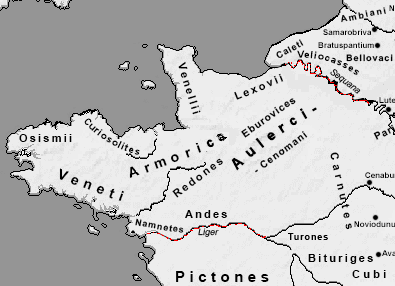 What if the Gaulic land of Armorica came to symbolise a land over the sea, offering sanctuary and opportunities, to the Celtic Britons in the British Isles, as well as in France and Spain)? After all, these were years of myth-making, with the rise of Arthur. By the time the Vikings invaded, Armorica became Brittany in the west, and a Frankish region in the east. Maybe the myth of Armorica lived on in the hearts of the Celtic and Gaelic people in Britain, so that by the time the Puritans, etc., looked to flee, they adopted the old name, representing their Armorican Dream. This may be true, or it may be like similar but unrelated morphology in the study of evolution. Correlation is not causation. It may be that it was just a verbal similarity. Or maybe not. But these sorts of things can be intriguing, and often end up being the springboard for children to pursue academic careers. Anyway, Armorica, itself, has received some notice in literature, as shewn by the Wiki article, ARMORICA. ("Not to be confused with America").